Organizational management is to plan for the future for the effective functioning of the organization. For this both the short range and the long range planning is needed (Fig 1). The idea of long range planning for the organization is rather new and was practically unknown several decades ago, but presently it is being done in most of the organizations. These days, there is hardly an organization which does not have an elaborate long range plans. It is rather necessary that each of the basic management decision is to be a long range decision. These days for an organization, especially in a large organization, ten years is considered to be short time span. Whether concerned with building new capacities or for introducing a new product in the market, or reorganizing the internal set up of the organization for its effective functioning, implementation of every major management decision takes years before it is really effective. And it has to be productive for years thereafter to pay off the investment made in men and money. Hence, the organizational management requires skills in making decisions with long futurity on a systematic basis. Management has no choice but to anticipate the future, to attempt to mould it, and to balance short range objectives with the long range objectives. Though looking into the future is not an easy job, yet the management is to ensure that these difficult responsibilities are not overlooked or neglected but are taken care off as well as it is to ensure that it is realistically possible. The future does not just materialize even if the management has very strong desires for it. The strong desires are not enough. The future needs decisions which are to be taken in the present. This requires action and also imposes risk for the management. It demands allocation of resources, and above all, of human resources and also requires work which is to be carried out today for the future. The knowledge of long range planning, and also much of its reality, depends on a number of careful understandings. The present and the immediate short range plannings require fully strategic decisions as much as the long range planning. The long range is largely made by short run decisions. Unless the long range is built into, and based on, short range plans and decisions, the most elaborate long range plan end into an exercise in futility. And conversely, unless the short range plans, that is, the decisions on the here and now are integrated into one unified plan of action, they are considered only to be expedient, guess, and misdirection. Both the ‘short range’ and ‘long range’ are not determined by any given time span. A decision is not short range because it takes only a few months to carry it out. What matters is the time span over which it is effective. A decision is not long range if the management resolves to make it 15 years later. This decision is not a decision but an idle diversion. It has as much reality as a six year old boy plans to become an engineer when he grows up. The idea behind long range planning is that ‘what the organization should be’ can and should be worked on and decided by itself, independent of the thinking on ‘what the organization is’ and ‘what it is to be’. There is some sense to this. It is necessary in strategic planning to start separately with all three thinkings, namely (i) what the organization is, (ii) what it is to be, and (iii) what the organization should be. These are, and should be, are separate conceptual approaches. With respect to ‘what the organization should be ‘ the first assumption need to be that it is going to be different. Long range planning is needed to prevent the management from uncritically extending present trends into the future, from assuming that today’s products, services, markets, and technologies are going to be the products, services, markets, and technologies of tomorrow, and, above all, from dedicating their resources and energies to the defense of yesterday. Planning ‘ what the organization is’, ‘what it is to be’ and ‘what the organization should be’ have to be integrated. What is short range and what is long range is then decided by the time span and futurity of the decision. Everything that is ‘planned’ becomes immediate work and commitment. For this, the skill which is needed is not long range planning. It is strategic decision making, or perhaps ‘strategic planning’. Sometimes it is called ‘strategic business planning’. The ultimate objective of the activity is to identify the new and different areas of operations, technologies, and markets which the organization is to try to create in the long range. But the work starts with the question, ‘what is the present area of operation’. Indeed, it starts with the questions ‘which of the present area of operations needs to be abandoned’, ‘which is required to be played down’, and ‘which is required to be pushed and augmented with new resources’. This may sound like splitting of hairs and, to a point, it is. But it very often leads to confused thinking. It may tend to paralyze strategic decision making rather than to mobilize for it. It is largely to blame for the failure of many of the large organizations so far to obtain results from elaborate planning efforts. For the understanding of the strategic planning, it is equally important for the management to know what strategic planning does not constitute. This is explained by the following four points (Fig 2). The first point – It tells the management that the strategic planning is not a box of tricks or a bundle of techniques. It is analytical thinking and commitment of resources to action. Many techniques can be used in the process, but, then again, none may be needed. Strategic planning can require a computer support, but the most important questions, e.g., ‘ what the organization is’, and ‘what it should be’ cannot be quantified and programmed for the computer. Model building or simulation can be helpful, but they do not constitute strategic planning. They are tools for specific purposes and may or may not apply in a given case. Quantification is not planning. To be sure, management is required to use rigorous logical methods as far as possible so as to make sure that it is not misled itself. But some of the most important questions in strategic planning can be phrased only in terms such as ‘larger’ or ‘smaller’, and ‘sooner’ or ‘later’. These terms while quantitative cannot easily be manipulated by quantitative techniques. And some equally important areas, e.g., areas relating to regulatory and political environment, social responsibilities, or human (including managerial) resources, cannot be quantified at all. These can be handled only as restraints, or parameters, but not as factors in the equation itself. In short, the first point can be summarized by stating that strategic planning is not the ‘application of scientific methods to organizational decision’. It is the application of thought, analysis, imagination, and judgment. It is responsibility, rather than technique. The second point – Strategy planning is not forecasting. It is not masterminding the future. Any attempt to do so is unwise since the future is unpredictable. Management can only discredit what it is doing by attempting it. If a planner still suffers from the misconception that a person is able to forecast beyond a very short time span, let him see how the changes have taken place in last few decades. No one would have predicted a few decades back the revolution in the field of communication brought by smart mobile phones. Similarly many of the political as well as economic upheavals being experienced these days were beyond imagination even one or two decades back. The satellite communication and cheaper and faster air travel of today is turning the world into a global village leading to the development of many multinational corporations and unprecedented level of global trade. These changes in the environment were unthinkable even a few decades back. Therefore, it is but natural that people must start out with the premise that forecasting is not a suitable human activity for long range planning and not worthwhile beyond the shortest of periods. Hence, strategic planning is necessary precisely since people cannot forecast. Another, even more compelling reason why forecasting is not strategic planning is that forecasting attempts to find the most likely course of events or, at best, a range of possibilities. But the organizational problems are unique events which can change the likelihoods since the organizational environment is not a physical but a social environment. Indeed, the central organizational contribution, which alone is rewarded with a profit, is to bring about the unique incident or innovative event which changes the economic, social, or environmental situation. This is what the organizational management is usually looking forward to do. It looks for and concentrates on such an incident or innovative event which has capabilities of changing the organizational environment. Since the organizational management generally upsets the possibilities on which predictions are based, forecasting does not serve the purposes of planners who seek to direct their organizations to the future. It certainly is of little use to planners who normally innovate and change the ways in which people work and live. Hence, forecasting is not an adequate basis even for purely adaptive behaviour, let alone for the management decisions of strategic planning. The third point – Strategic planning does not deal with future decisions. It deals with the futurity of the present decisions. Decisions exist only in the present. The question which is faced by the strategic decision maker is not what his organization has to do tomorrow. It is ‘what is required to be done today to be ready for an uncertain tomorrow’. The question is not what is going to happen in the future. It is what futurity is to be built into the present thinking and doing, what are the time spans which are to be considered, and how this information is to be used to make a rational decision now. Decision-making is a time machine which synchronizes into one present a large number of divergent time spans. The management is only learning this now. Its approach still tends toward making plans for something it is to decide to do in the future, which may be engaging but is futile. Management can make decisions only in the present and yet it cannot make decisions for the present alone. The decisions which are the most expedient, most opportunistic decisions, the decisions which alone are not to decide at all but can commit the organization for a long time, if not permanently and irrevocably. The fourth point – Strategic planning is not an attempt to eliminate risk. It is not even an attempt to minimize risk. Such an attempt can lead only to unreasonable and unlimited risks and to certain disaster. Economic activity, by definition, commits present resources to the future, i.e., to highly uncertain expectations. To take risks is the essence of economic activity. One of the most rigorous theorems of economics (Boehm-Bawerk’s Law) proves that ‘existing means of production will yield greater economic performance only through greater uncertainty, that is, through greater risk’. It is futile to try to eliminate risk, and questionable to try to minimize it. But at the same time, it is necessary that the risks which are taken are the right risks. The end result of successful strategic planning is the capacity to take a higher risk, since this is the only way to improve the organizational performance. To extend this capacity, however, management is required to understand the risks which are to be taken Management must be able to choose rationally among risk-taking courses of action rather than plunge into uncertainty on the basis of hunch, hearsay, or experience, no matter how meticulously quantified. After describing what strategic planning does not constitute, an attempt is now made to define what strategic planning is. It is the continuous process of making present managerial (risk-taking) decisions systematically and with the greatest knowledge of their futurity; organizing systematically the efforts needed to carry out these decisions; and measuring the results of these decisions against the expectations through organized, systematic feedback (Fig 3). As far as planning is concerned, whether long range or short range, there is nothing new. It is the organized performance of a task already undertaken. But here in strategic planning, the task rarely gets done unless organized. Overall, it rarely becomes an achievement unless done purposefully. Planning starts with the objectives of the organization. In each area of objectives, the enquiry which is needed to be made is, ‘what do the organization is to do now to attain its objectives in future’. The first thing to do to attain the future’s objective is always to be shedding off the past. Most plans concern themselves only with the new and additional things which are to be done such as new products, new processes, new markets, and so on. But the key to doing something different in the future is getting rid of those things which are no longer-productive, the outdated, and the obsolete. The first step in planning is to ask of any activity, any product, any process or market of the organization of today is that whether the organization is still committed and whether these are to be continued, and if the answer is no, then the planner is to think how the organization can get out of these activities fast. Systematic shedding off the past activities is a plan by itself. In many organizations it is done effectively. It forces thinking and action. It has also got the added advantage by making available the persons and capital for new activities. It creates willingness to act. On the other side, the plan which provides only for doing additional and new things without provision for shedding off old and worn-out activities is unlikely to provide results. It remain plan only on paper and never become a reality, yet getting rid of the past is the decision which most of the long range plans in the organizations do not tackle and hence it becomes the main reason for their futility. The next step in the planning process is to find out which are the new and different things which the organization are to plan and when. Every plan needs to have areas where all which is needed or appears to be needed, is reflected more than the areas where the activities being already done are appearing. It is sensible, however, to assume that what the organization is already doing is never adequate to the needs of the future. But, what activities are needed is only half the story. Equally important is the timing of the activities since it fixes the time for beginning of work on the new tasks. There is indeed a short range and a long range to every decision. The time between the commitments to a course of action, e.g., building of new facilities, and the earliest possible moment for results, i.e., getting the products from the facilities is the short range of a decision. And the long period it takes before, at the earliest, the organization get back with compound interest the capital invested in the facilities is the long range. The long range is the time during which the initial decision must remain reasonably valid with respect to the markets, process, technology, and location etc. so as to ensure that there has been the right decision originally. But it is meaningless to speak of short-range and long-range plans. There are plans which lead to action which is needed now and these are true plans, true strategic decisions. Also, there are plans which talk about action which is needed in future and these are dreams, if not grounds for non-thinking, non-planning, non-doing. The essence of planning is to make present decisions with knowledge of their futurity. It is the futurity which determines the time span, and not vice versa. There are limitations on futurity. In organizational decisions, the most precise mathematical statement is often that two parallels lines do not meet each other. In the expectations and anticipations of a management, the old rule of statistics generally applies that anything beyond twenty years equals infinity; and since expectations more than twenty years hence have normally a present value of zero, hence these activities are to receive only a minimal allocation of present efforts and resources. However, results which need a long gestation period are obtained only if initiated early enough. Hence, long-range planning requires knowledge of futurity that is what is needed to be done now if there is a requirement of some particular activity in the future. And if no resources are committed now then it is almost a certainty that the activity will not be get done in future. An example of a paper plant depending on the pulp of a variety of a fir tree explains this in a nice way. It is well known that it takes around ninety years to grow this variety of fir tree to pulping size. Hence, planting seedlings today is the only way to provide for pulp supply in ninety years. There is a possibility that someone may well develop some speeding- up hormone, but the paper plant cannot bank on it since the plant functions in the paper industry. It is quite imaginable and perhaps highly possible that the wood will be used primarily as a source of chemicals long before these trees grow to maturity. The paper supply thirty years hence may have to depend on less precious, less highly structured sources of cellulose than a tree, which is the most advanced chemical factory in the plant kingdom. This simply means, however, that forests may put their proprietors into the chemical industry sometime within the next thirty years and they had better learn now something about chemistry. If, however, paper plant depends on the variety of fir tree, planning cannot confine itself to twenty years, but must be based upon ninety years. On the other hand, in an example of an organization which buys up distress merchandise and sells it at auction, even five years for decision making is an absurdly long period, since for such an organization, next week’s clearance sale is long-range future and anything beyond is largely irrelevant to it. Thus, the nature of the organization and the nature of the decision determine the time spans of planning. Time spans are neither static nor ‘given’. The time decision itself is a risk-taking decision in the planning process. It largely determines the allocation of resources and efforts. It largely determines the risks taken. It is frequently stated that to postpone a decision is in itself a risk-taking and often irrevocable decision. The time decision largely determines the character and nature of the organization. 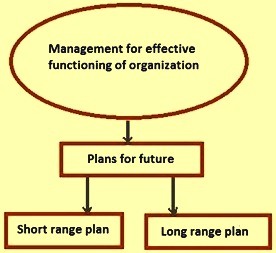 The crucial issues in the strategic planning can be summarized as (i) that systematic and purposeful work on attaining objectives to be done, (ii) that planning start out with shedding off the past, and that abandonment be planned as part of the systematic attempt to attain the future, (iii) that to look for new and different ways to attain objectives rather than believe that doing more of the same can suffice, and (iv) that the planner is to think through the time dimensions and to ask when to start the work to get results at a time when they are needed. The best strategic plan is only a plan, that is, only good intentions, unless it degenerates into work. The difference which marks a plan capable of producing results is the commitment of key people of the organization to work on specific tasks. The test of a strategic plan is whether the management actually commits resources to action which will bring results in the future. Unless such commitment is made, there are only promises and hopes, but no plan. A plan needs to be tested by when the management asks itself which of the best people it can put on this work today. And if the answer it gets that the best persons cannot be spared now and these persons are to finish what they are doing now before they can be put to the work only on tomorrow, then it is simply admitted that there does not exist any plan. But this also proves that there is a need for a plan, since it is precisely the purpose of a plan to show where scarce resources (the scarcest is good people) are to be working. Work implies not only that someone is supposed to do the job, but also accountability, a deadline, and finally the measurement of results, that is, feedback from results on the work and on the planning process itself. In strategic planning, measurements present very genuine problems, particularly conceptual ones. Yet precisely since what is being measured and how it is measured determine what is thought to be relevant, and determine thereby not just what is seen, but what the people do, measurements are all-important in the planning process. Above all, unless the expectations are built into the planning decision in such a way that there are their early realizations and whether they are actually fulfilled or not (including a fair understanding of what are significant deviations both in time and in scale), it is not possible to plan. There are no feedbacks, no way of self-control from events back to the planning process. The planner cannot decide whether he wants to make risk-taking decisions with long futurity and he makes them by the definition of his role. All that is within his power is to decide whether he wants to make them responsibly or irresponsibly, with a rational chance of effectiveness and success, or as a blind bet against all odds. And both since the decision-making process is basically a rational process and since the effectiveness of the organizational decisions depends on the understanding and voluntary efforts of others, the approach is to be more responsible and more likely to be effective if it is rational, organized, and based on knowledge, not prediction. However, the end result is not the knowledge but a strategy. Its purpose is to act now. Strategic planning does not substitute facts for judgment, does not substitute science for the planner. It does not even lessen the importance and role of planner’s managerial ability, courage, experience, intuition, or even hunch. On the contrary, the systematic organization of the planning job and the supply of knowledge to it strengthen the planner’s judgment, leadership, and vision.